On May 20th at Madison Square Garden in New York City, NY undefeated unified WBO/WBC Jr. Welterweight world champion Terence Crawford displayed all of the skills and characteristics that have made the Omaha, NE native a two-division world champion. In what was the fifth defense of his unified Jr. Welterweight crown, Crawford battered top contender Felix Diaz over ten rounds to retain his position as the consensus number one fighter in the 140. Jr. Welterweight division. The skills of Crawford's hand speed, lateral movement, and punching power were the story of the fight as the champion got the better of his opponent in every round battering Diaz, the 2008 Jr. Welterweight Olympic Gold medalist before the fight was stopped by Diaz’ corner at the conclusion of the tenth round. Despite his pedigree and having given former world champion Lamont Peterson all he could handle in a hard fought loss in October 2015. Crawford was simply too much for Diaz, who showed his mettle in defeat. As for the characteristics Crawford also displayed in this fight, they are the type of characteristics that are often associated with great fighters that have served Crawford well in his career thus far. Crawford not only has natural athletic ability, but what has been most troublesome for most of his opponents and what this observer feels makes him even more of a difficult challenge for his opposition is the systematic approach he uses in virtually every fight in looking to see what his opponent offers and then implementing a strategy that sees him gradually take control of the fight by cutting off the ring and strategically placing his punches with the intent of breaking the opponent down rather than simply looking to overwhelm his opposition with his hand speed and/or power. In his fight against Felix Diaz, Crawford showed this approach and although Diaz was able to periodically land a flush punch on the champion, Crawford had an answer for anything the challenger had to offer. As the bout progressed the combat began to resemble most of Crawford's previous fights. Crawford being extremely accurate with his offense and gradually administering a beating to a very “Game”, but overmatched opponent. The victory over Diaz for Crawford, his thirty-first win in as many fights not only allowed him to retain his position as the central figure of the Jr. Welterweight division, but perhaps more importantly depending on one's perspective allows him to remain in position to potentially challenge future Hall of Famer Manny Pacquiao in the future. As most Boxing fans know however, Pacquiao, the current WBO Welterweight world champion is scheduled to defend that championship in Australia on July 2nd. Although Crawford appears to be the logical option for the winner of that fight in what would be a move up in weight to the 147lb. Welterweight division, as readers might recall prior to Crawford's encounter with Diaz that this observer stated that Crawford could be the next dominant Jr. Welterweight champion, despite the potential of more lucrative opportunities outside of the division. In the week since Crawford's latest title defense, I have thought about two possible scenarios if a fight with the winner of Pacquiao-Horn is not in the cards for Crawford. The first option would be for Crawford to attempt to further unify the Jr. Welterweight division by facing undefeated unified IBF/IBO/WBA Jr. Welterweight world champion Julius Indongo in what would be a fight to determine the first undisputed Jr. Welterweight world champion in the history of the sport. Even though many of the dominant Jr. Welterweight champions throughout history have all at one time or another looked to the Welterweight division and beyond for more lucrative opportunities, this would be a viable option due to the fact that one of the two undefeated champions would walk away as the undisputed champion of the division, which would also likely increase the chances of either fighter gaining a lucrative opportunity at a higher weight. The second option if Crawford is more intent on testing the waters of the Welterweight division could be for him to look to challenge the winner of today’s IBF world Welterweight championship fight between champion Kell Brook and undefeated challenger Errol Spence. As to which option is the most viable/logical of the two, this observer believes Crawford may be better served to seek the undisputed Jr. Welterweight world championship possibly before the end of 2017 before setting his sights on the Welterweight division. Much like Crawford, Julius Indongo is a highly skilled fighter who may not be as well known due to his never fighting in the United States. Indongo however, scored a dominant victory in adding the World Boxing Association (WBA) crown to his unified championship over former three-division world champion Ricky Burns in April. Coincidentally, Crawford also holds a victory over Burns in winning his first world championship in March 2014. Whether or not this coincidence would be used as a comparison if a fight between Crawford and Indongo is made remains to be seen, but it is clear that Terence Crawford has options which could be on the table outside of an encounter with the winner of the Pacquiao-Horn clash. It will simply come down to which option Crawford chooses to pursue. For now, Boxing fans and experts alike await the next chapter in the career of the undefeated two-division world champion. We would like to let our readers know that new material discussing the recent Terence Crawford-Felix Diaz world Jr. Welterweight championship fight will be released on Saturday, May 27th. Stay tuned. "And That's The Boxing Truth." On May 6th the Boxing world converged on the T-Mobile Arena in Las Vegas, NV to see Saul “Canelo” Alvarez, one of the sport's biggest stars do battle against Julio Cesar Chavez Jr. in a highly anticipated encounter of two of Mexico’s top fighters. Alvarez, a two-division world champion who is quickly making a push to establish himself as Boxing's top pay-per-view draw facing a former WBC Middleweight world champion in Chavez Jr., who for years was pushed as a pay-per-view attraction as “The Son Of The Legend” following in the footsteps of his father Julio Cesar Chavez Sr. the man regarded by many as the greatest Mexican fighter of all-time. Some would argue that despite being victorious in fifty of his fifty-four professional fights and winning a world championship along the way prior to facing Alvarez, that Chavez Jr. has not fulfilled his full potential perhaps in part due to the impossible task of following his father and trying to establish his own legacy. Chavez had also seen his career marred by inconsistencies in the ring in regard to both problems making weight and his performances as well as personal problems outside the ring. Although Chavez came into the fight having won his previous two bouts after suffering a knockout loss at the hands of Andrzej Fonfara at the Light-Heavyweight limit of 175lbs. in April 2015, this observer did question how Chavez would look in this bout against Alvarez given that the fight took place at a catchweight of 164lbs. four pounds above the 160lb. Middleweight limit and a weight that Chavez had not fought near in nearly five years since losing his Middleweight championship to Sergio Martinez in September 2012. A question that only seemed more valid following the weigh-in when Chavez, who was able to make the contracted limit of 164lbs. looked utterly gaunt. It was understandable how some including this observer could question whether the process of trying to make weight would have an effect on Chavez in the fight. Even though this fight had the ingredients of a special occasion for the sport including the passionate fan followings of both fighters, a sell out crowd in attendance, and the festive atmosphere surrounding Cinco de Mayo weekend, this would not be a classic encounter deserving of a label of a “Super Fight” known for a thrilling give and take battle, but rather an occasion that was more about the event than what took place in the ring. For twelve rounds, Alvarez battered Chavez from pillar to post to such a degree that it resembled more of a sparring session rather than an actual fight. Rather than giving an analysis of a fight that was frankly one-sided in favor of Alvarez, who won all twelve rounds for a unanimous decision victory, the focus should be on what will follow this fight as it was announced immediately in the ring after Alvarez’ victory over Chavez. On September 16th, Alvarez will face undefeated unified WBA/IBO/IBF/WBC Middleweight world champion Gennady Golovkin for Golovkin’s Middleweight crown. This is a fight that has been one that Boxing fans and experts alike have been anticipating as the sport’s next legitimate “Super Fight.” Although this is a fight that needs to happen, in my opinion, there has also been an element of controversy that has surrounded the announcement of the fight being signed in that some have questioned whether the Alvarez-Chavez bout was “A Fix.” The basis of this theory is rooted not only in how the fight was announced with Golovkin making an entrance following Alvarez’ victory over Chavez in a fashion similar to how some Mixed Martial Arts (MMA) bouts have been announced, but also Chavez’ overall lack of offense throughout the twelve round bout. This observer has talked with several Boxing fans in the days since the Alvarez-Chavez bout took place who all shared the opinion that they felt the fight was a done deal before it got in the ring last weekend. Even though it is understandable how those who paid $69.95 for this fight and it’s accompanying undercard on a pay-per-view basis may feel disappointed due to the lack of action that took place in this bout, it is worth noting that both due to the gradual increase in prices of pay-per-view Boxing cards over the years as well as at times only getting access to between three to five fights on a card for the price rather than the full card that when a main event fails to live up to expectations it may be all too tempting to call a foul on the sport and by extension it’s fans. Speaking only for myself, I do not feel that the Alvarez-Chavez fight was not on the level. Prior to this bout, some across various social media platforms asked me for my opinion as to whether or not I felt Chavez had a chance in this fight due in large part to how he looked at the weigh-in. I responded to this question by stating that any fighter who gets in the ring has a chance because after all, all it takes is one punch. I also explained that it was my view that it would depend on whether or not the task of coming down to make weight took too much out of Chavez. Although I do not feel that a thorough analysis is warranted in this case Chavez, a fighter who has almost always had a height and reach advantage over most of his opponents has always used a come forward pressure style that has one goal, to gradually break an opponent down. As some readers who have followed this observer’s coverage of Julio Cesar Chavez Jr.’s career over the years both in magazines as well as various online outlets may recall, I have always been of the opinion that Chavez did not make use of his physical advantages by using his height and reach to keep an opponent at distance. He has always fought in a style that I have stated in the past was perfectly suited for his father who stands 5’7 ½ with a 66” reach who began his career at or around the 126lb. Featherweight division and never fought above the 147lb. Welterweight division in his career whereas Chavez Jr., who stands 6’1 with a 73” reach who began his career as a 130lb. Jr. Lightweight and quickly progressed up the scale to the 154lb. Jr. Middleweight division, 160lb. Middleweight division, and had fought his last four fights prior to the encounter with Alvarez in either the 168lb. Super-Middleweight division or the 175lb. Light-Heavyweight division is a naturally bigger man as compared to his father. Despite never fighting in a style that would make use of his height and reach, Chavez elected to attempt to box Alvarez from a distance that would theoretically allow him to use his natural size and reach. It was clear after four rounds however, that the strategy Chavez and his new trainer Ignacio Beristain had developed was not working and Chavez simply could not adapt and revert to the pressure style he had used for most of his career. Even though it is commendable that Chavez would look to improve/change his Boxing style after fifty-four professional fights, this was not the time where he should have adapted to a different style and perhaps this in addition to not being able to consistently put himself in a position where he could throw and land punches was the story of the fight. It does nothing however, to take away from the performance of Saul Alvarez. While it was by no means an exciting fight to watch, Alvarez did what he had to do and looked impressive in doing so against a naturally bigger fighter whom may have been compromised by the drop in weight, but more importantly was compromised by being the lesser fighter in terms of skill. This brings us back to the story that came out of this fight, the upcoming showdown between Gennady Golovkin and Alvarez which is scheduled for September 16th at a site to be named. If there is a silver lining to a fight that did not live up to expectations or the price that consumers were asked to pay to see it, it is that a legitimate “Big” or “Super” fight is on the horizon. Although some will no doubt say that this fight could and should have already occurred, it should be noted that this encounter will take place in a considerably quicker time frame as compared to other would be “Big” or “Super” fights that have taken place in years past. One concern however, that those who are behind this fight should keep in mind is the backlash that took place after Boxing's last big “Mega” event when a fight Boxing fans waited nearly a decade for the Floyd Mayweather-Manny Pacquiao encounter in 2015 turned out to be a major disappointment in the eyes of many as much like the Alvarez-Chavez bout, it failed to live up to expectations. When you factor in that the Mayweather-Pacquiao event was the most expensive pay-per-view attraction in history priced at nearly $100 and the general increase of pay-per-view prices outside of the “Big”, “Super”, or “Mega” event one may question whether Boxing fans will be as quick to spend their money regardless of what the main event of such an event might be. A valid question as more and more consumers are choosing to move away from traditional cable/satellite television and move toward Over The Top (OTT) digital distribution and thus do not have legal access to events carried exclusively on cable/satellite pay-per-view. 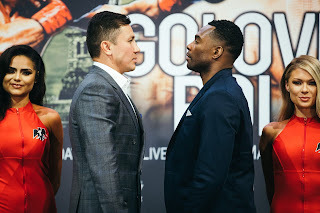 As is the case with most “Big” or “Super” fights this observer has no doubt that the event of Golovkin-Alvarez in of itself will be it's own story. It is my hope however, as the event nears, anticipation increases, and the Boxing world focuses its attention on Boxing's next showdown that when all is said and done Boxing fans and those of us in the media are not talking about another underwhelming moment for the sport that will be more known for the “Spectacle” of the event than what takes place in the ring where no matter the outcome the ultimate authority, the Boxing fan feels once again to be the victim of injustice due to paying an expensive price for something that failed to deliver on expectations. Boxing as a sport is truly given a boost when a “Mega” event is remembered for the right reasons. One only needs to look at the recent encounter between Anthony Joshua and Wladimir Klitschko to see that when a fight exceeds the atmosphere of the event as well as expectations, the Boxing fan does not complain about being “Cheated” or “Let Down” afterwards, does not offer suggestions of a possible “Fix” and/or questions the integrity of a referee or the judges scoring a bout, but rather talks about the “Great Fight” they saw and what they anticipate may be in store for both fighters next which can only encourage increased interest in the sport particularly among casual fans. Such enthusiasm is even better when the Boxing fan is not charged such a high price in order to witness such an occasion. After an occasion where 90,000 people packed the legendary Wembley Stadium in London, England, over a million more ordered Joshua-Klitschko on pay-per-view in the United Kingdom for a far more reasonable price of €24.95 for the HD broadcast of the event with even millions more tuning in to see what became an all-time classic around the world, Gennady Golovkin and Saul “Canelo” Alvarez sure have a tough act to follow. If one were to take a poll of Boxing fans who ranged from the casual fan to the die hard enthusiast on what is one aspect about the sport of Boxing that most can universally agree on, you would probably get varying answers because of course, the question in itself is general in nature and does not center around a specific subject regarding the sport. One topic however, that usually draws the interest of both the enthusiast as well as the casual fan is when a special occasion is on the horizon. The type of occasion that epitomizes the “Big Fight” atmosphere. Of all the “Big Fights” that take place in Boxing, one thing most folks would say whether casual fan or enthusiast is there is nothing quite like the anticipation that precedes a World Heavyweight championship fight. A discussion regarding two hard-hitting Heavyweights each with knockout power entering the ring to do battle alone is enough to draw varying opinions as to what may or may not happen when the two fighters square off. When the storyline of the encounter centers on a former longtime champion, who lost his crown returning to the ring after a lengthy absence to attempt to regain the championship as well as his standing in the sport against a young unbeaten “Knockout Artist”, it is certainly understandable how anticipation can only increase as the days, weeks, and at times months prior to a showdown go on. When a fight not only draws interest among each fighter’s respective fanbase, but interest on a true global scale the ingredients of a special occasion are present that more often than not turns a highly anticipated fight into an event. When those ingredients include a legendary venue and a massive crowd of spectators to witness the encounter, you have the very definition of the “Big Fight” atmosphere. On April 29th, over 90,000 people packed the legendary Wembley Stadium in London, England to witness such an event as undefeated “Knockout Artist” Anthony Joshua made the third defense of his International Boxing Federation (IBF) Heavyweight world championship against former longtime champion Wladimir Klitschko. Prior to this encounter, this observer stated that this was a classic scenario of youth versus experience. Although there were questions that surrounded both fighters, I felt the focus would be on the former champion Klitschko due in large part to his lackluster performance in losing his championship to Tyson Fury in 2015 as well as his being inactive since that loss. Of course, some could make an argument that for a fighter who was as active as Klitschko was at the height of his dominance over the Heavyweight division that perhaps an extended hiatus would be appropriate to allow the fighter’s body adequate time to recuperate from the riggers of training and other injuries that can occur over the course of a long career. The counter argument however, which has just as much validity is that as a fighter gets older, extended time out of competition can actually do more harm than good due to the effects age can have on one’s reflexes as well as reaction time, which are crucial in all of sports, but especially with regard to combat sports. It surprised me to see Klitschko begin this fight coming forward working behind his jab. Although this had not been uncommon for Klitschko throughout his career, I felt strongly prior to this fight that he would elect to allow Joshua to come forward and look to counter his normal aggression as the champion looked to apply pressure. It was nevertheless an interesting tactic implemented by the challenger from the outset. One thing that the champion did early on that I felt was an effective strategy was Joshua focused part of his offense on Klitschko's body, which has been something that some previous Klitschko opponents have been unable to have consistent success in attempting against him due to Klitschko usually having a height and reach advantage as well as his ability to control distance with his jab and straight right hand. Even though the two fighters were equal in height, it was an element of offense that was executed well by the champion. What was also evident was that Joshua was not awed by the occasion of fighting in a legendary venue such as Wembley Stadium and did not appear pressured by the support of the massive crowd in attendance. Although both fighters were able to have their share of moments early on, it appeared as though the champion had a slight edge due to landing the harder punches of the two. Joshua was also able to withstand the Klitschko jab/right hand combination, a focal point of Wladimir Klitschko's offense for many years in the early rounds. Despite showing more aggression and more of a willingness to engage than he had against Tyson Fury, Klitschko seemed to have some difficulty landing power punches early due to Joshua choosing to box and not look for a quick knockout. What was an exciting yet tactical battle in the early rounds however, would change as the bout progressed. At the beginning of the fifth round, Joshua was able to stun the former champion with a left hook to the jaw setting off a barrage of offense, which opened a cut over Klitschko's left eye and resulted in him going down on his knees to the canvas. Upon scoring the knockdown, an energetic Joshua pressed forward looking for the stoppage, but under circumstances where previous Joshua opponents were unable to recover and ultimately crumbled under the power of the twenty-seven year old “Knockout Artist” Joshua, Klitschko withstood the assault and by the end of the fifth round appeared to turn the tide as Joshua looked to have punched himself out. Despite suffering some knockout losses early in his career where some including this observer questioned his ability to take a punch, Klitschko deserves much credit for his ability to recover under such circumstances and it would be the challenger who would have his say in round six. It would be at this stage in the fight where Klitschko would force Joshua to answer a question that inevitably follows all fighters who are labeled “Knockout Artists.” What happens to the fighter once they are hit flush and more specifically, how will that fighter respond after being sent to the canvas? Despite being the victim of a knockdown in the previous round and in serious trouble for half of that round, Klitschko was able to take advantage of the momentum he was able to build late in round five by dropping Joshua for the first time in his career with a flush straight right hand to the jaw behind a jab. The unbeaten champion was able to show that he was not only capable of getting up from a knockdown, but also proved that he could withstand punishment as Klitschko pressed forward and continued to find success in landing his right hand. This fight clearly was one where some long sought answers to questions surrounding both fighters were answered. Following his knockdown of the champion in round six, Klitschko was able to dictate the combat by controlling distance and generally seemed to get his punches off first and land more effectively than Joshua in the second half of the fight and after ten rounds this observer had the fight even on my scorecard. In round eleven however, the fight would come to a sudden and dramatic conclusion in a fashion that most think of when they think of the Heavyweight division at it’s best. As was the case in round five, Joshua staggered Klitschko at the beginning of the round, but did not pressure Klitschko as aggressively as he did in the fifth round likely due to not wanting to risk being badly compromised by putting himself in a position where he punched himself out and thus allowing his hurt challenger the opportunity to recover. The champion instead took a more calculated approach and staggered Klitschko badly with a devastating right uppercut to the chin setting off a barrage of punches that sent the former champion down to the canvas. Klitschko, showing his mettle arose from the knockdown only to be dropped for a second time by a follow up barrage from Joshua. Klitschko again was able to get up from the knockdown, but it was academic as Joshua pressed forward and after landing a few more solid blows the bout was stopped. It was a thrilling encounter where both men proved something to their critics. For Anthony Joshua, the third defense of his world championship also earned him the World Boxing Association (WBA) and International Boxing Organization (IBO) Heavyweight world championships that were previously vacated by Tyson Fury following his scheduled rematch with Klitschko never becoming a reality, but more important in this eyes of this observer and any critic of Joshua before this bout took place, he proved he belonged in the ring with a fighter who for over a decade ruled over the Heavyweight division as it’s unified world champion. Despite only having nineteen professional fights, Joshua showed not only the ability to overcome adversity to win a fight and retain his championship, but he did so by knocking out his opponent and proved he belongs at the top of the division as one of three fighters who currently hold a claim to the World Heavyweight championship along with the World Boxing Council (WBC) world champion Deontay Wilder and the World Boxing Organization (WBO) world champion Joseph Parker. Although he came out of this fight having suffered his second consecutive loss, an argument can be made that Klitschko in this defeat may have finally earned his just due from Boxing fans who simply did not appreciate his dominance and/or Boxing style during his second reign as a Heavyweight world champion, much in the same way as other dominant champions such as Larry Holmes and Evander Holyfield received overdue recognition only after they lost their championships and are now rightfully regarded as two of the greatest Heavyweights of all-time. Klitschko was also able to show despite some setbacks early in his career where he suffered knockouts where he was knocked down and was unable to recover, that he could fight on and nearly was able to come back after the first of what became three knockdowns to nearly end the fight himself by knockout. The former champion also deserves praise, in my opinion for being able to get up from an uppercut that would have ended the night for most Heavyweights and valiantly try to fight on, Even though there were punches that followed the crushing right uppercut from Joshua, there is no disputing that it was that blow that led to Klitschko going down in the eleventh round in the second of what became three overall knockdowns he suffered over the course of the fight. In the near two weeks since Joshua-Klitschko took place I have had one question running through my mind. How long will it be before there is a second encounter between Joshua and Klitschko? It is after all a fair and logical question to ask not only given the exciting combat these two fighters produced, but also the overall success the fight generated in producing over one million pay-per-view buys in the United Kingdom as well as over ten million viewers on German television network RTL in addition to producing over a million combined viewers here in the United States on both Showtime and HBO, who each produced separate broadcasts of the event for the first time in history. The official weigh-in for Saturday’s pay-per-view clash between two-division world champion Saul “Canelo” Alvarez and former WBC Middleweight world champion Julio Cesar Chavez Jr., which will take place at the T-Mobile Arena in Las Vegas, NV took place earlier today. The official weights for the entire card are as follows. Saul Alvarez 164lbs. vs. Julio Cesar Chavez Jr. 164lbs. Joseph Diaz (Champion 125 1/2lbs. vs. Manuel Avila 125 lbs. David Lemieux 163lbs. vs. Marcos Reyes 163lbs. Ronny Rios 122lbs. vs. Daniel Noriega 122lbs. Emmanuel Taylor 147lbs. vs. Lucas Matthysse 147lbs. Samantha Salazar 111lbs. vs. Marlen Esparza 110 1/2lbs. Joseph Aguirre 135lbs. vs. Angel Aispuro 134lbs. Ryan Garcia 131 3/4lbs. vs. Tyrone Luckey 131 1/2lbs. Alvarez vs. Chavez takes place tomorrow night (Saturday, May 6th) at the T-Mobile Arena in Las Vegas, NV. The card can be seen in the United States and Canada on cable and satellite providers on HBO Pay-Per-View as well as www.Fite.TV and www.goldenboyppv.com for $69.95 (HD and Standard Definition.) The pay-per-view broadcast will begin at 9PM ET/6PM PT. Contact your cable or satellite provider or visit www.Fite.TV or www.goldenboyppv.com for ordering information. In the United Kingdom and Ireland the card can be seen on Boxnation beginning at 2AM (Sunday, May 7th Local UK Time.) For more information please visit: www.boxnation.com. Check your listings internationally.